Sheikh Khalaf Mardani arrested for protesting lack of flood aid. A resident of Marvaneh Village in the southwestern province of Khuzestan was arrested yesterday by Iran’s security forces for protesting the regime’s lack of aid to his village and for preventing security forces from breaking the villagers’ flood barriers. The man, who was taken to an unknown location, has been identified as Khalaf Mardani, a Sheikh and village elder of Marvaneh. Reports indicate that security forces wanted to break the flood barriers to direct flood water to the villagers’ farmlands. This comes after floods ravaged the north, south and west of Iran with angry Iranians complaining that the regime was not providing adequate relief to the victims. Yesterday, Iran’s Chief of Police vowed to crack down on unrest in flood stricken areas. “The Police will deal decisively with those who disrupt order and security in flood stricken areas,” the chief commander of the Law Enforcement Force of the Islamic Republic of Iran, Hossein Ashtari told reporters. There have been reports that security forces and Islamic Revolutionary Guards Corps forces attacked angry locals in Khuzestan and the western province of Lorestan. 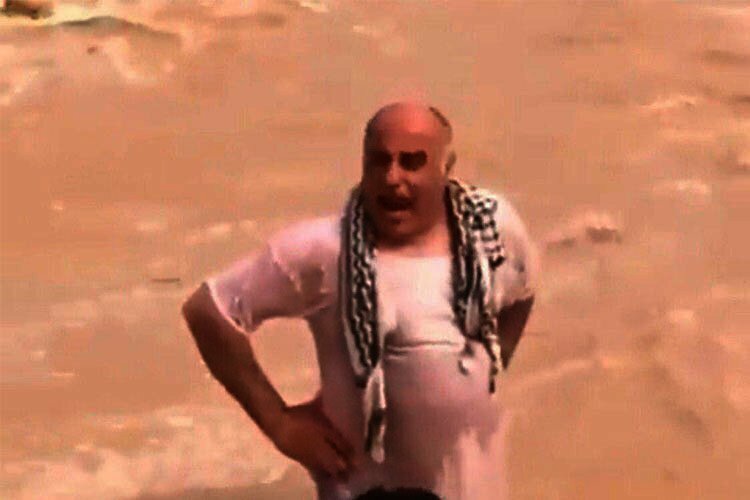 Although the IRGC denied reports of scuffles with locals in Jelizi Village in Khuzestan’s Dasht-e Azadegan, reports indicate that a man identified as Aboud Jalizi died after the IRGC opened fire on locals protesting the explosion of their flood barriers by the IRGC which directed water to their village and farmlands. 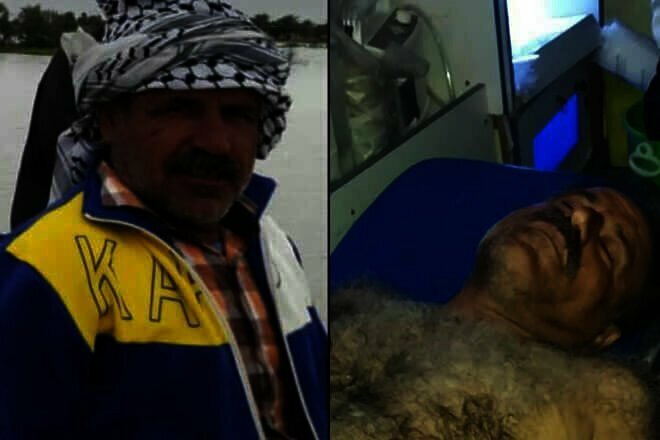 Aboud Jalizi before and after death. The father of six died due to the severity of his wounds in a hospital in the southwestern city of Ahvaz on Thursday. Reports indicate that the farmlands, which have now been engulfed by water after the IRGC blew up the barriers, were the villagers only source of income. 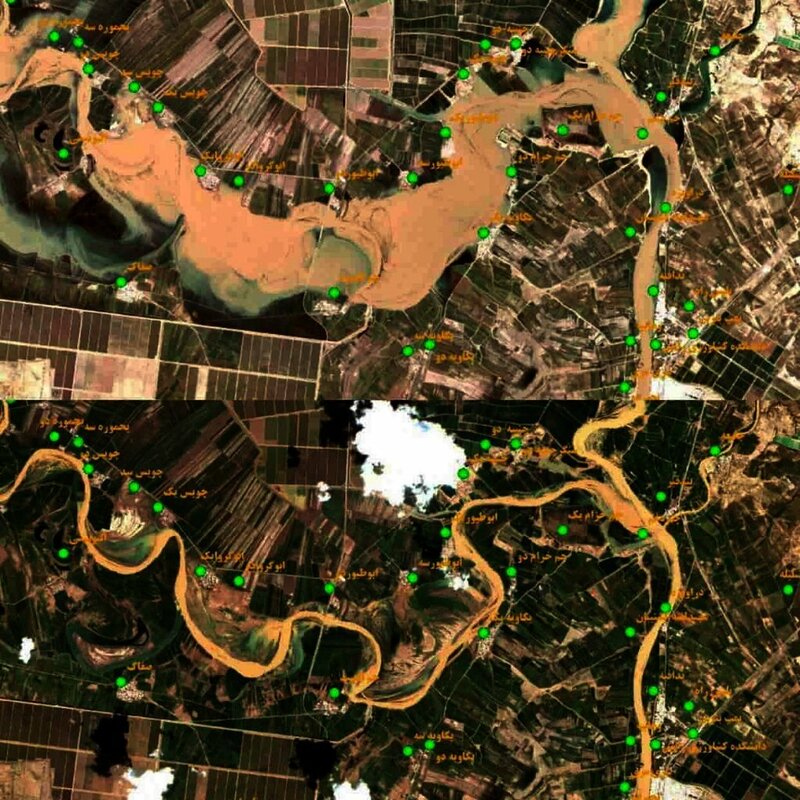 Before and after image of floods in Khuzestan. According to state-run news agencies, there will be more thunderstorms and floods in the upcoming days in Iran.